A stray plastic bag recently caused a street in the Williamsburg section of Brooklyn to be shut down. 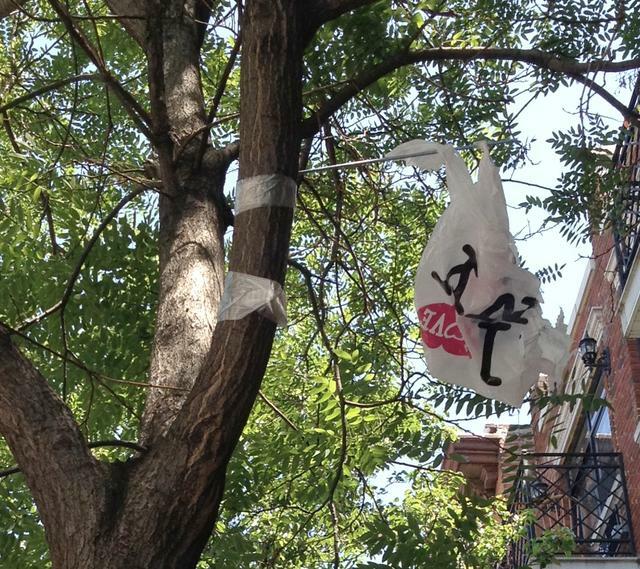 No one knows for sure where the bag came from, but the discarded bag was stuck in a tree and a resident of a building near the tree alerted police to a ‘suspicious’ looking plastic bag. Emergency crews blocked off the street to vehicle and pedestrian traffic and had residents and employees from local businesses remain indoors while they investigated for about an hour until the situation was deemed safe and the street was re-opened. In the end it was determined that the plastic bag contained a battery with wires attached to it – this most certainly added to the suspiciousness of the ordeal. It has been suggested that the bag may be part of an urban art project. It is unfortunate to think someone would intentionally cause the fear and chaos this possible art endeavor achieved. Street shutdowns and evacuations may not have been the original intention if the bag was purposefully placed in the tree; however, that is exactly what happened. Artistic expression is a freedom we are fortunate to have, but that right needs to be exercised in a safe and considerate manner. At this time no one has come forward to claim responsibility for the bag or to take artistic credit, so this theory remains just a theory. The case against litter is pretty solid. Trash on streets and in communities just takes up space and is an eyesore. In extreme situations animals may eat litter and can become sick or even possibly die as a result. At first thought litter causing a street to be shutdown sounds a little excessive, but safety should be taken seriously. Since the situation panned out to be safe and the bag was just litter lodged in a tree example of how damaging litter can be. Since plastic bag litter is so commonplace it would be a great Trojan horse for people with destructive intentions to disguise the tools of their devastation. Had this bag turned out to mask a bomb it would have put the residents on this busy street in harm’s way, as well as the shop employees, street vendors, and visitors. Had this situation been an actual emergency there could have been a lot of devastation. It is also worth noting that police and fire departments had to be called to respond, so they spent time investigating a non-issue instead of using their time for something constructive that could have helped and benefited the people of Williamsburg. This is all the more reason to reduce the amount of garbage strewn about. It seems like as long as plastic bags are handed out in the checkout lane a certain percentage will end up as litter. Stepped up recycling efforts are great and have been proven to work, but litter still persists. The only logical way to end this cycle is to stop using plastic bags. In cities and towns and now even states with disposable plastic bag bans shoppers have no choice but to not use plastic bags; however, you do not need a ban to dictate the vessel you use to bring your groceries home. Reusable shopping bags are an easy way to do your part and reduce the amount of plastic bags in circulation. Fewer bags in circulation will mean fewer bags in landfills and fewer bags will end up as litter. Less litter will ensure streets and neighborhoods are clean, will keep animals out of harm’s way, and will also reduce the risk of suspicious bags tangled in tree branches. It is a little crazy to think that making the switch to reusable grocery bags will give the residents of your community piece of mind, but if a suspicious bag stuck in a tree can set off alarms once it can happen again. Giving up disposable plastic bags will not put an end to the litter cycle all at once, it will take time and patience, but you can turn the tide and make a change in your neighborhood. Reusable bags can do everything disposable bags can do, just without the negative drawbacks, such as being harmful to the environment and contributing to litter. Safety should always be taken seriously and nothing, not even a plastic bag in a tree, should be overlooked. Go to http://www.dnainfo.com/new-york/20120518/williamsburg/suspicious-bag-on-bedford-avenue-williamsburg-draws-closes-street to read more about the suspicious bag in Williamsburg. Want the Hottest Trends in Custom Reusable Bags?